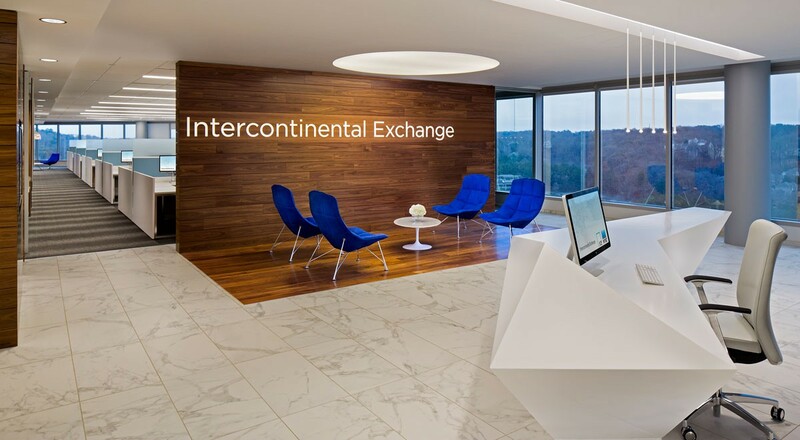 Furnishings take center stage with bright blue leather upholstery at the Atlanta headquarters of Intercontinental Exchange (ICE), a regulated exchange and marketplace clearinghouse company. The interior renovation by Heery International is designed to support an evolving ‘smart’ workplace and includes a mix of materials, balancing natural materials with sleek modern finishes. Ducale Velour is upholstered on Knoll’s Jehs+Laub lounge chairs in the reception area and Sabrina on Herman Miller’s Eames Aluminum Group chairs in an executive conference room. For more information, please visit the Ducale Velour (DV) and Sabrina (SA) product pages.